The answer is that when we started, we decided that there really isn’t any reason to store artists as individual documents. They are just reference data, after all. Now, however, we need to reference them. But I still think that artists don’t really exists in this model as an independent entity. So instead of going with this route, we are going to project them. If you’ll look carefully, you’ll notice that this is essentially doing a distinct over all the artists across all albums. There is one very important things to remember here: In Raven’s queries are cheap, because Raven allows you to query indexes only, and those indexes are built in the background, making queries tend to be very fast. That changes the way that you think about designing you system and data model. You want to move a lot of your processing to indexes and queries upon those indexes, because it tends to be cheaper all around. I keep trying to work on the replication bundle for Raven, but I keep getting distracted with more interesting stuff. In this case, I kept coming back to several discussions that I had with people who want to use Raven for storing events, and were thinking about how to go from a stream of events to a complete aggregate. I kept thinking that Raven should already be able to handle that. And indeed it can, quite easily, it turns out. Raven is already capable of running operations over a stream of document to produce a value, to go from there to event stream producing an aggregate is easy. The only problem was that we needed to support external views. That was easy enough to do, so let me show what we have now. 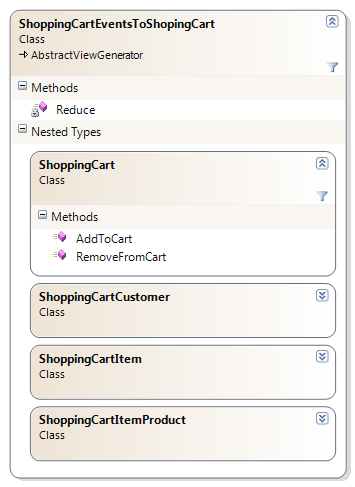 Let us assume that we have the events shown on the right stored in Raven, as you can see, this is a stream of events for a shopping cart. What we want to have is to go from there to an actual shopping cart. I am showing the class diagram here to show you all the types that are involved here. Note that ShoppingCart has AddToCart and RemoveFromCart method, which has the typical implementation. The display name is the name of the index. 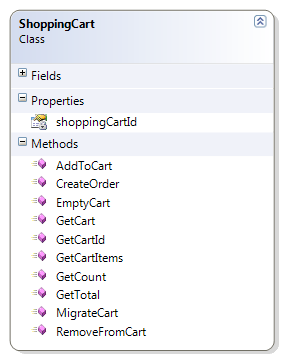 In the constructor, we define the map part as filtering for events for the shopping cart. We will create a shopping cart per shopping cart id, so we specify the group by extraction method. Raven will use that to optimize updates. Note the indexes definition, we want to id to be stored as as a primary key, and the aggregate data to be stored, not analyzed for searching. Now, let us talk about the interesting bits, the Reduce function. 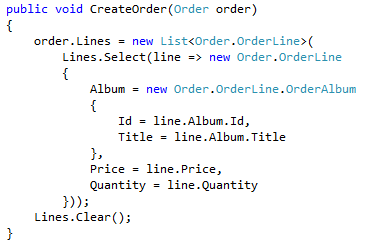 That function should be pretty easy to follow, I think. We are getting a stream of events, grouping them by their shopping cart id. 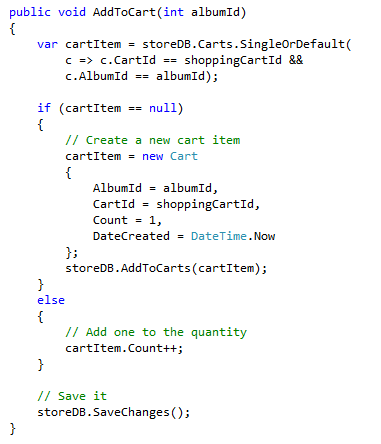 Then, for each shopping cart, we sort the events by date, and proceed to build the aggregate. Finally, we return the data so Raven will store it in the index. Using this approach, Raven will automatically keep the aggregate definition up to date with the event streams coming on. Furthermore, that aggregate will only be computed when a change happen, so accessing it is very cheap. 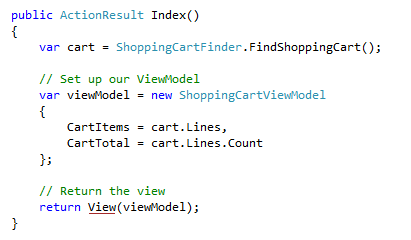 Finally, if we have a storm of events on a particular shopping cart, we can choose whatever to wait and see it in its most version, or get a potentially stale view of it really fast. 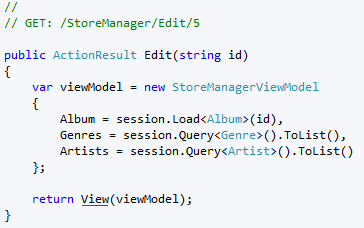 The final part of the port of the MVC Music Store to Raven is the administration section, implemented in StoreManagerController. I am going to show comparisons of all the methods where the port doesn’t offer anything new, and then focus on an interesting conceptual difference between the implementations. Please note that the main reason that the Raven code is so much shorter is that I threw away the nonsensical error handling (or lack thereof). 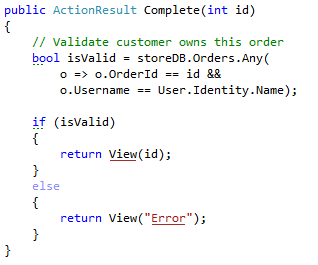 Again, throwing away the error handling that isn’t made a lot of the difference in the code. Now we get to an interesting difference. 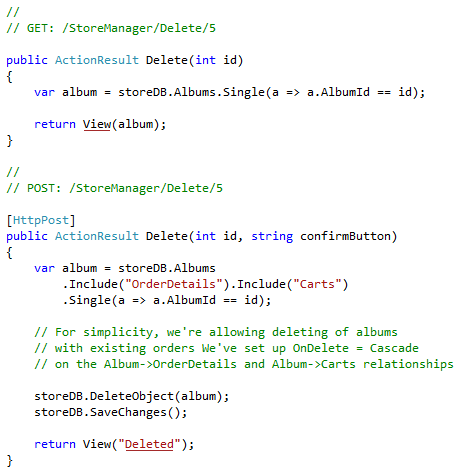 The old code will delete orders if they include the deleted album. Raven’s code does no such thing. A bit more formally, documents in Raven are independent, they aren’t affected by changes to other documents. 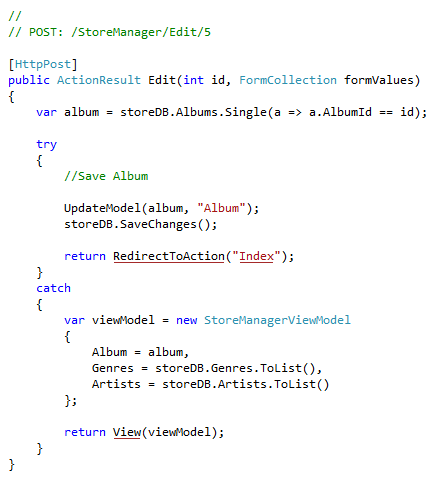 There are two more methods to discuss with regards to the StoreManagerController, but I’ll discuss them in my next post. This class simply tracks the number of instances that it has. It does no blocking and operates entirely in memory. This just run in a loop, creating two instances of the enlistment (forcing it to be distributed transaction), and commit the transaction. After the transaction is completed, we read how many enlistments are still alive. Surprisingly, I keep getting non zero values here. The really freaky part is that if I’ll put a small wait there, I’ll get zero value back, which is what I would expect. 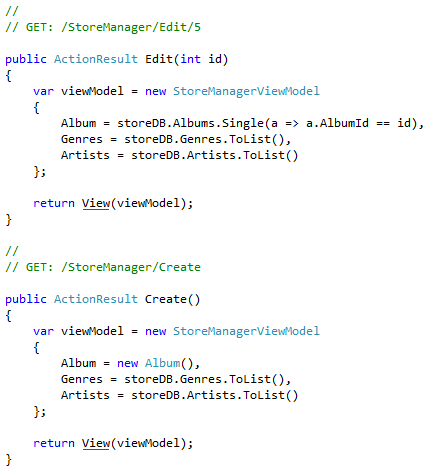 This is on .NET 4.0, by the way. This method is synchronous and blocks until the transaction has been committed or aborted. Hmm… that is not what I am seeing here. 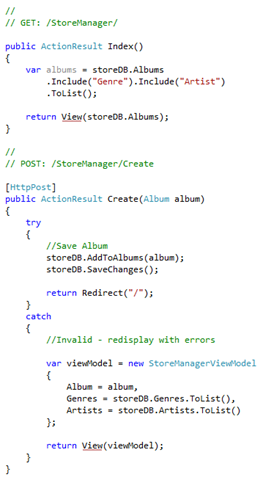 From what I see here, I would say that it is only waiting until Prepare is called, not until Commit / Rollback is called. The way I implemented things, prepare does all the actual work, but it is the commit that switch things around so those changes are visible. The result of this behavior is that until Commit has been called, the transaction has not been really committed. On prepare, commit the transaction, but keep around the data required to roll it back. On commit, cleanup everything that is required to do the cleanup. On rollback, use the cleanup data to rollback the transaction. On doubt, dance a merry jig and then throw yourself off the bridge. But that is based on the behavior of the code, not on what I am seeing on the docs, and it is seems wrong. The checkout process in the MVC Music Store is composed of two parts, adding address & payment options and completing the order. The old code for address & payment is on the left, the new on the right. As you can see, they are quite similar. Raven’s code isn’t complete yet, though. 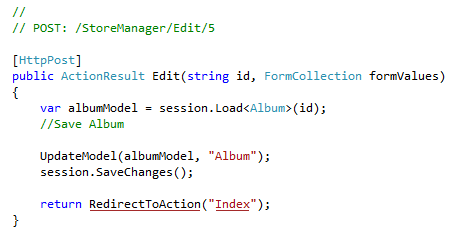 It is important to note that we are loading all the albums document in a single query. And when we save, Raven is going to make a single (batched) call to the server. I think by now you can tell what is going on in each system. The next post will cover the administration section. 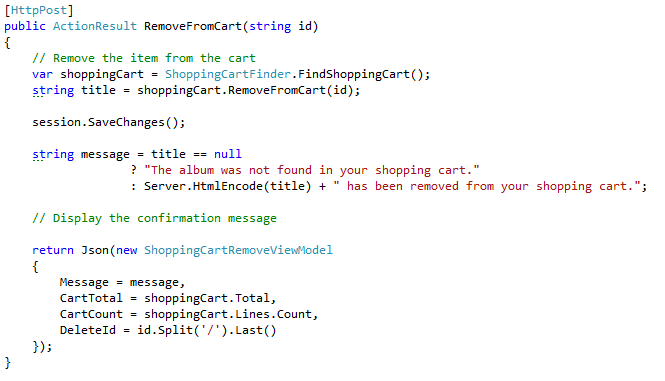 This just implements the logic of loading the cart from Raven or creating a new cart (with the specified shopping cart id), note that we don’t save the new cart to the database here, merely associate the new cart with the session. 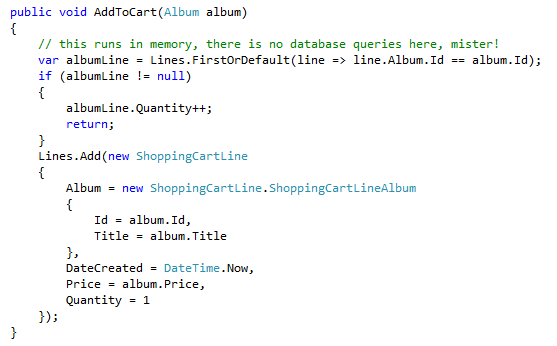 There is no need to save, since it contains no meaningful data at this point. When we will call SaveChanges(), the new cart will be send to Raven for storage. On the left, you can see the old version, and on the right, you see the Raven version. 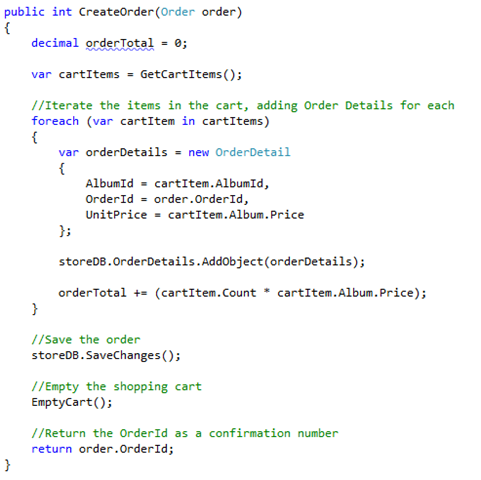 They are pretty similar, except that in the Raven case, the shopping cart’s AddToCart is concerned solely with adding a new item to the cart or incrementing the quantity of an existing item. 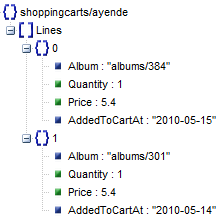 There is absolutely no data access in the Raven’s version of ShoppingCart.AddToCart. 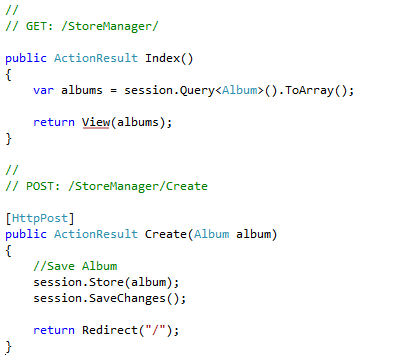 One major difference is that the Raven approach is calling the session.SaveChanges() in the action code. The reason for that is simple, it is the proper place for this, as the calling code, it is responsible for the environment, including saving when needed. Raven’s code is pretty easy to follow here, I think. There is just one thing that you should note, the last line is pretty strange id.Split ? Why do we do that? Again, this is about as simple as you can make it, so I’ll note only that Raven’s approach can benefit from the unit of work cache, and the old code approach can’t. In my next post, we will deal with the order process. Why won’t you take my money, you stupid moronic dummy? I like reading, specifically, science fiction and fantasy has always had a huge pull on my imagination. That let me to a great series of books by Ilona Andrews, the latest of which has just come out. I live in Israel, and shipping time & cost from the US is quite prohibitive. At times, I have paid four or five times the cost of the book just to be able to get the bloody thing. So the rise of the Kindle filled me with a great sense of relief. I got a Kindle and started reading on that (I love it). I estimate that I read over 200 books on the thing already. We're writing to let you know that we've canceled your order for Magic Bleeds because it will not be released by the publisher in Kindle format on Tuesday, May 25, 2071 as previously expected. We don't yet have a date for when this item will be released for Kindle. We will send you an email notifying you when the Kindle edition becomes available. Okay, annoying. Let us hit audible.com and see if they have the audio book version available. It appears that this is not the case… but I can buy the CD version, which requires physical shipping, from Amazon. Where does it leaves me? There seems to be no way for me to get the book in a reasonable timeframe/cost. Wait, let me rephrase that. There appears to be no legal way. While I have no direct knowledge of that, I am guessing that if I hit a torrent site and try to search for the book, I would not only find the book, but will be able to get the freaking thing faster than going with the legal download route. It is actually quite simple. I would really like to give you some money, if you make it harder for me to give you money, you won’t get my money. This decision is stupid, moronic, idiotic, senseless, irritating, annoying and in general lack all sense. 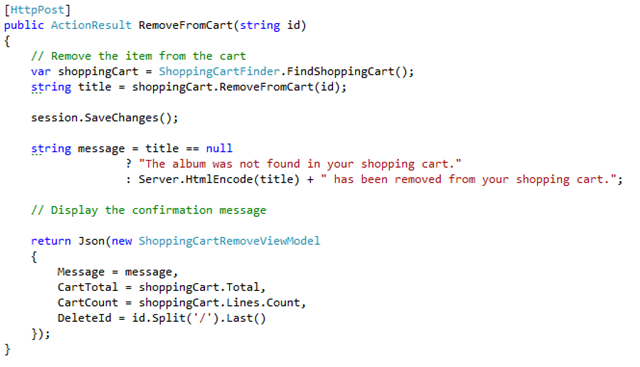 The ShoppingCart class in the MVC Music Store is my current punching bug, I really don’t like it. You might have noticed that all the operations about a shopping cart are get operations. All the operations of the cart are things that belong to the cart, it is the cart’s business logic and reason for being. 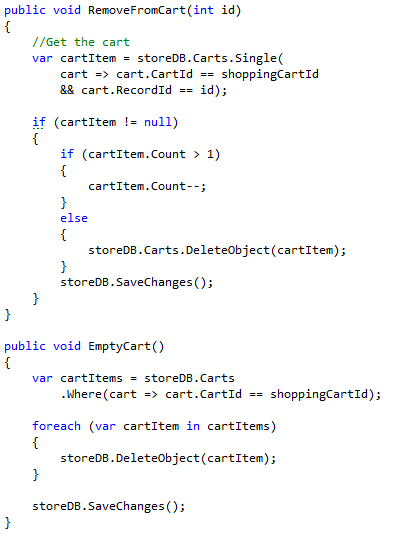 The Get operations don’t belong to the cart, they belong in some other object that manages instances of carts. In most applications, we would call this object a Repository. I am not sure that we really need one here. 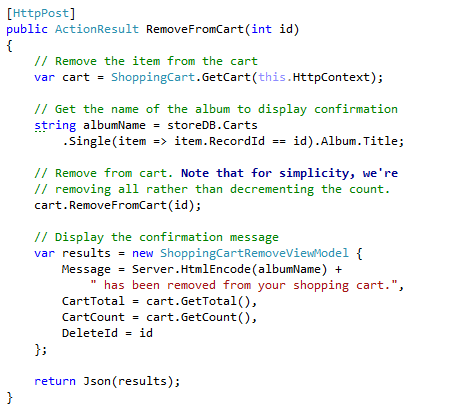 Looking at the Get methods, most of them are here because of the decision to only store cart line items, which requires us to issue explicit queries to get the data. 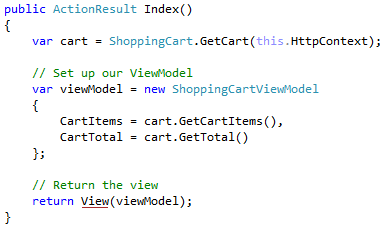 With Raven, we would follow a different model, which means that the only thing we are likely to need is GetCart() and maybe GetCartId(). The GetTotal method was replaced with a Total property. 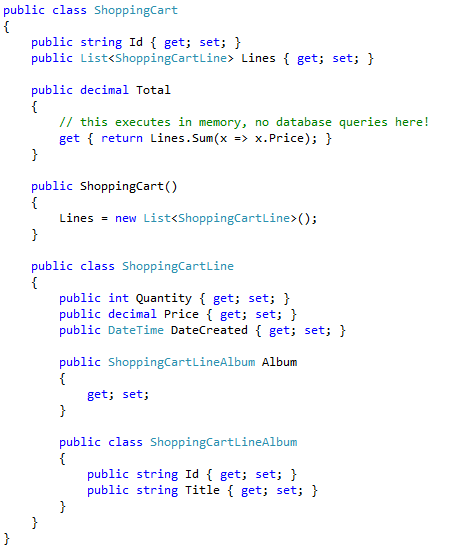 Until the GetTotal method, with issued a query to the database, this property operates solely in memory. This is another major difference with Raven vs. OR/M solution is that Raven doesn’t do lazy loading. This is by design, since document dbs data models rarely need to traverse data outside their own document. Traversing the document from Raven cannot force lazy loading or result in the dreaded SELECT N+1 issues. Note that we don’t expose GetCartId anymore, this is an internal detail that shouldn’t be seen by clients of this class. 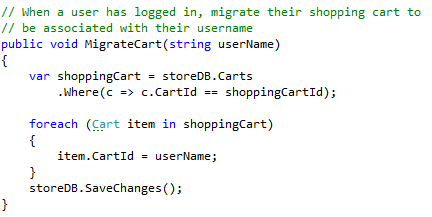 We do need to support setting the cart id, because we also support cart migrations (when an anonymous users logs in). We don’t need any of the other methods, so I removed them. Let us go over the operations of the cart. 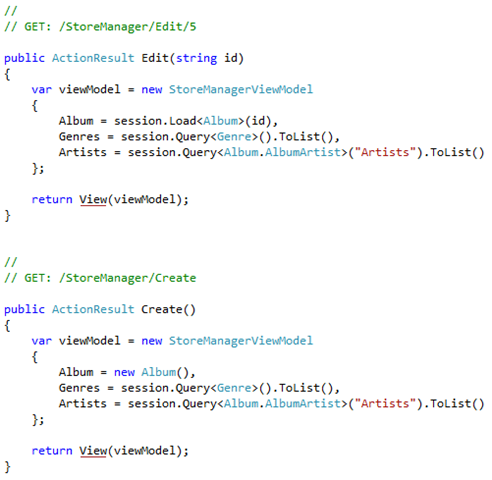 The method on the left is the original code, and on the right you can see Raven’s code. The Raven code operates completely in memory, and in totally persistence ignorance. 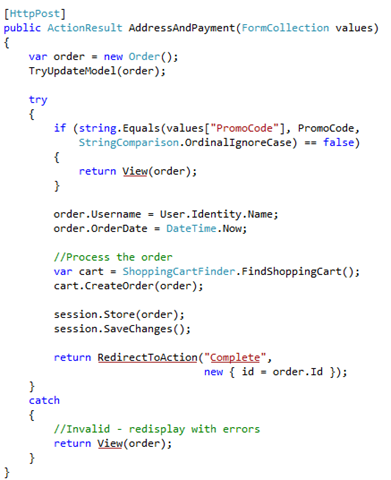 The old code is deals explicitly with persistence. This isn’t that much of a problem, except that this is the wrong level to deal with persistence issues. 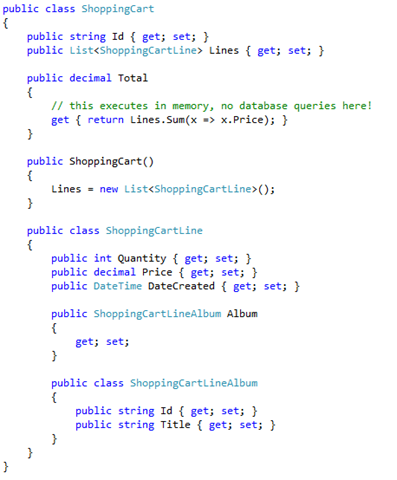 It is interesting to note that EmptyCart in the old implementation would result in N queries, where N is the number of items in the cart, while with Raven, this will result in 1 query. 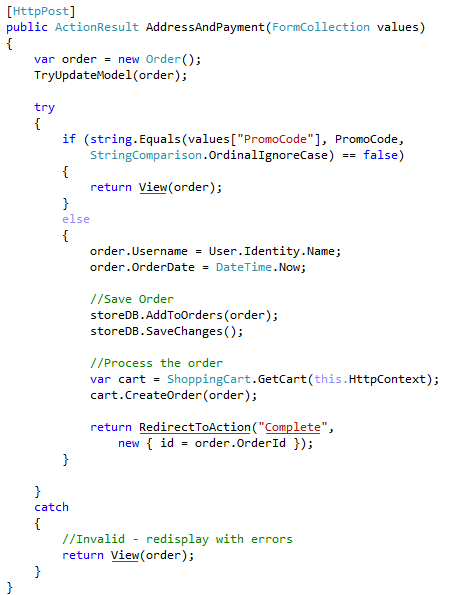 With the old code, we update all the items in the cart, one at a time. With Raven, we do something drastically different. 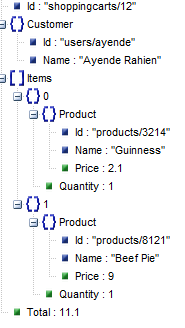 The Shopping Cart Id is the document key, so given the shopping cart id (which is the user name or stored in the session), we can load the shopping cart in using a Load (by primary key, to equate to the relational mindset). 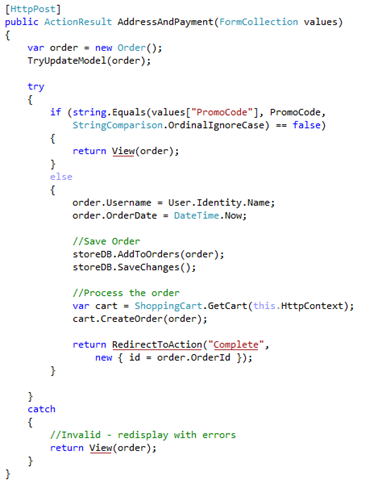 Migrating a cart is a simple enough operation, all you have to do is change the key. 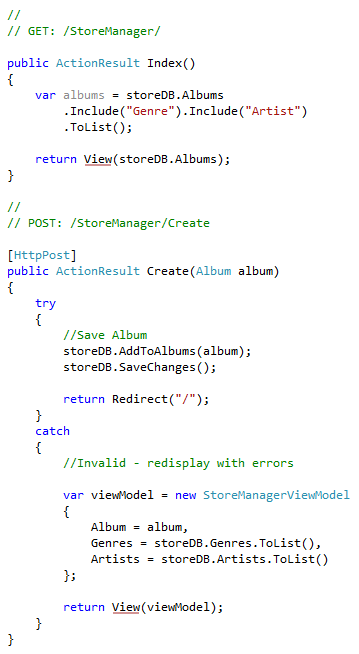 Since Raven doesn’t allow renames, we do it with a Delete/Store, which are executed inside a single transaction. 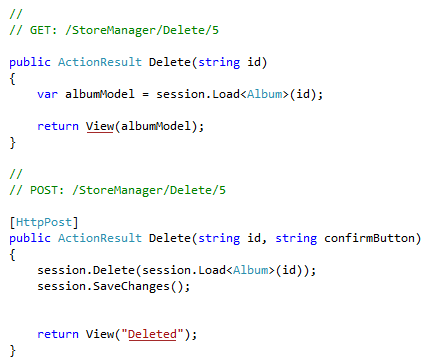 Note that SaveChanges is atomic and transactional, so this has the same effect as issuing a rename. And that is it for the shopping cart, in my next post, I’ll discuss the ShoppingCartController which uses this class. This post is copied (with permission) from Roy Osherove. I don’t often do things like that but Roy’s post has pushed a lot of red buttons. A month or so ago, Microsoft Israel started sending out emails to its partners and registered event users to “Save the date!” – Micraoft Teched Israel is coming, and it’s going to be this november! “Great news” I thought to myself. I’d been to a couple of the MS teched events, as a speaker and as an attendee, and it was lovely and professionally done. Israel is an amazing place for technology and development and TechEd hosted some big names in the world of MS software. A couple of weeks ago, I was shocked to hear from a couple of people that Microsoft Israel plans to only accept non-MS teched speakers, only from sponsors of the event. That means that according to the amount that you have paid, you get to insert one or more of your own selected speakers as part of teched. I’ve spent the past couple of weeks trying to gather more evidence of this, and have gotten some input from within MS about this information. It looks like that is indeed the case, though no MS rep. was prepared to answer any email I had publicly. If they approach me now I’d be happy to print their response. They are diluting the quality of the speakers for pure money factors. That means, that as a teched attendee, who paid good money, you might be sitting down to watch nothing more that a bunch of infomercials, or sub-standard speakers – since speakers are no longer selected on quality or interest in their topic. I do hope this ends up not being true, but it looks like it is. MS Israel had already done such a thing with the Developer Days event previouly held in Israel – only sponsors were allowed to insert speakers into the event. If this turns out to be true I would urge the MS community in Israel to NOT TAKE PART AT THIS EVENT in any form (attendee, speaker, sponsor or otherwise). by taking part, you will be telling MS Israel it’s OK to piss all over the community that they are quietly suffocating anyway. MS Israel has managed to screw the MVP program as well. MS MVPs (I’m one) have had a tough time here in Israel the past couple of years. ever since yosi taguri left the blue badge ranks, there was not real community leader left. Whoever runs things right now has their eyes and minds set elsewhere, with the software MVP community far from mind and heart. No special MVP events (except a couple of small ones this year). No real MVP leadership happens here, with the MVP MEA lead (Ruari) being on a remote line, is not really what’s needed. “MVP? What’s that?” I’m sure many MS Israel employees would say. Exactly my point. I’ve been disappointed by the MS machine for a while now, but their slowness to realize what real community means in the past couple of years really turns me off. Maybe it’s time to move on. Maybe I shouldn’t be chasing people at MS Israel begging for a room to host the Agile Israel user group. Maybe it’s time to say a big bye bye and start looking at a life a bit more disconnected from that giant. I hear the people at Google are pretty Agile! And now back to me. I had more discussions in the last two years with Microsoft UK than with Microsoft Israel. I think it says it all, and I am an Israeli MVP who spends most of his time in Israel.